The word “petroleum” translates to “rock oil.” It stems from the Greek word petra, meaning rock, and the Latin word oleum, meaning oil. Oil is created from the decomposition of organic materials under intense heat and pressure over millions of years. Oil has been used by people for over 5,000 years and was effective for treating ailments such as gout and frostbite. Crude oil was first pumped from the ground in Sichuan, China about 2,500 years ago. Oil was first successfully drilled on land in the U.S. in Titusville, Pennsylvania, in 1859 and the first offshore wells were drilled off the coast of Louisiana, U.S. in the 1950s. The Texas Oil Boom and the modern industrialization of oil production in the U.S. began with a major gusher at Spindletop in 1901, in Texas. With a fierce vision, John D. Rockefeller revolutionized and dominated the oil industry in the late 19th century. It’ is said that John Rockefeller had a net worth measuring, today’s equivalent, of $1.4 trillion, at the time of his death. For the last hundred years, we have been producing oil to fulfill the world’s energy needs and to capitalize on petroleum’s use in a plethora of products including gasoline, synthetic fabrics, plastics and pharmaceuticals. During the crude oil refining process, products are synthesized for use in fertilizers, plastics, car tires, ammonia, perfumes and more. Oil is also used to make common synthetic fabrics like polyester, nylon, vinyl and acrylic. The world economy has been capitalizing on oil and it is directly responsible for about 2.5% of world GDP yet it accounts for 1/3 of the world’s energy supply. Oil coupled with natural gas accounts for over 50% of the world’s energy supply. Crude oil is measured in barrels, which are each equivalent to 42 U.S. gallons. One barrel of oil accounts for about 19.15 gallons of gasoline, 9.21 gallons of diesel, 3.82 gallons of jet fuel, 1.75 gallons of heating oil and about 7.3 gallons for other petrochemical products like tar, asphalt, bitumen, etc. Total daily oil production around the world about 84,249,000 barrels/day. Much of the world’s oil and gas is used for transportation. The world’s oil and gas transport infrastructure are a globe-spanning spiderweb of pipelines and shipping routes. It has been said that the natural gas distribution pipelines in the U.S. alone could stretch from the Earth to the Moon, 7-8 times. Saudi Arabia produces 8.1 million barrels of oil per day. The Ghawar oil field in Saudi Arabia is the largest oil field in the world and it contains about 85 billion barrels of oil. Saudi Arabia is the largest oil producer in the world and it has the largest amount of reserves at 267 billion barrels. Following close behind at number two is Venezuela and then Canada is the third largest holder of oil reserves on the planet. 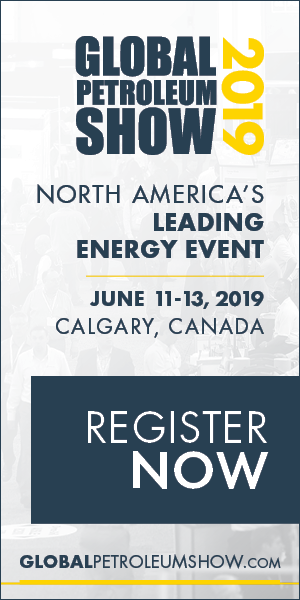 97% of Canada’s oil comes from the oil sands; however, Eastern Canada has shown incredible seismic showings that speculate the possibility of this region being the next North Sea. 2015, drew the largest land sales in the world offshore Newfoundland and Labrador, indicating its powerful proposition that is most attractive to oil companies. Shell Oil operates in over 70 countries around the globe and has close to 100,000 employees. There are about 8000 Shell employees in Canada. 50% of Shell’s production comes from natural gas with 24 million tons of equity LNG sold during the year. 3.1 million barrels of oil equivalent are produced every day and there are about 43,000 Shell services stations worldwide. Shell’s Athabasca Oil Sands Project (AOSP) is a joint venture project with Shell owning 60% majority shares and it is one of Shell’s major projects worldwide. The current production capacity of AOSP is 255,000 barrels a day of synthetic crude, 11.5 percent of Canada’s domestic demand for oil. Since 2005, the Athabasca Oil Sands Project has contracted over $1 billion of business to Aboriginal companies and invested over $13 million in social programs supporting communities neighboring our oil sands operations. 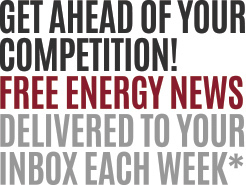 Shell Canada’s Upstream businesses explore for and extract natural gas, and market and trade natural gas and power. Shell’s Downstream business refines supplies, trades and ships crude oil worldwide and manufactures and markets a range of products, including fuels, lubricants, bitumen and liquefied petroleum gas (LPG) for home, transport, and industrial use. Shell Oil is a major player world-wide. Offshore Nova Scotia has seen wells drilled in the region since 1967 and a total of 200 explorations, delineation and development wells have been drilled in an area of about 120,000 km2. 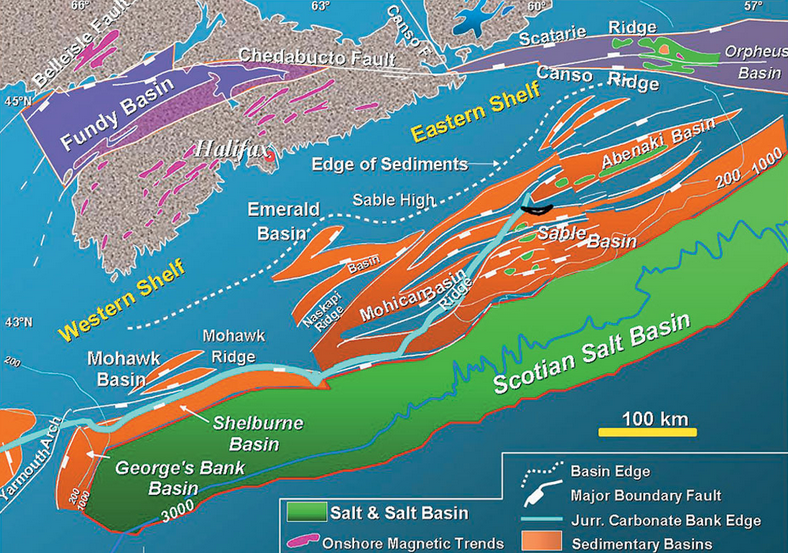 The Scotian Shelf and Slope area hold a series of lucrative basins and sub-basins where reservoirs and source rocks are found in the post-rift and passive margin sequences. The major area of focus for exploration offshore Nova Scotia has been the Sable Basin, an area of 10,000 km2 in water depths of a few meters to 200 m where all but two of the significant discoveries have been made. 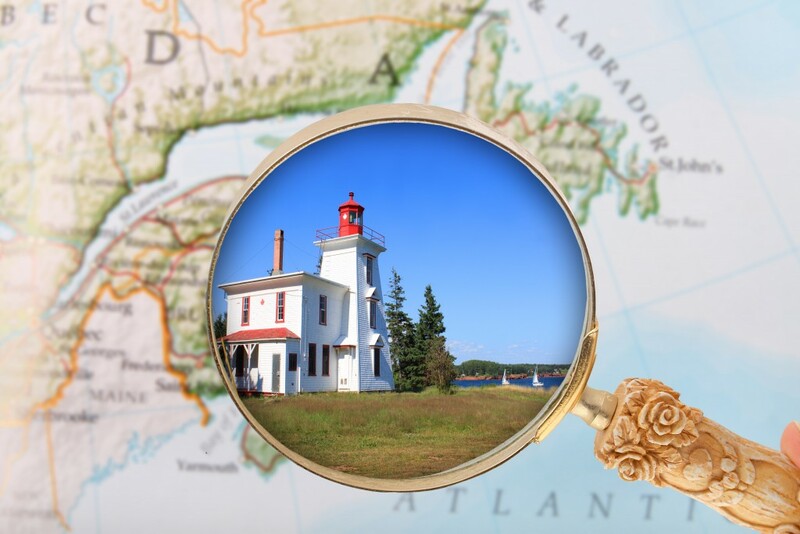 Click here for a list of declared discoveries offshore Nova Scotia. 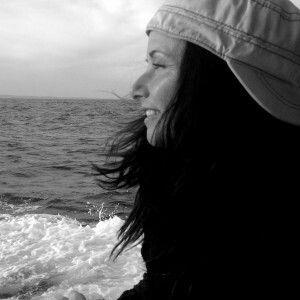 The Canada-Nova Scotia Offshore Petroleum Board granted Shell exploration licenses for nearly 20,000 square kilometers in March 2012 and 2013 following Shell’s success in two separate calls for bids. Shell Canada committed to spending nearly $1 billion to explore for oil and gas offshore Nova Scotia over the next six years. ConocoPhillips and Suncor Energy joined Shell as Joint Venture partners on its Deepwater Shelburne Basin Venture Exploration Program. 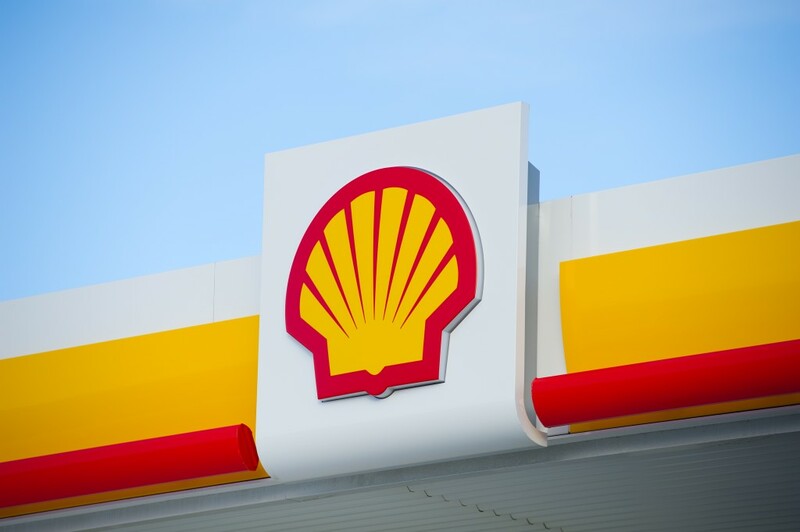 Shell maintains a 50% interest and remains the operator of the project. ConocoPhillips acquired a 30% non-operating interest and Suncor acquired a 20% non-operating interest. 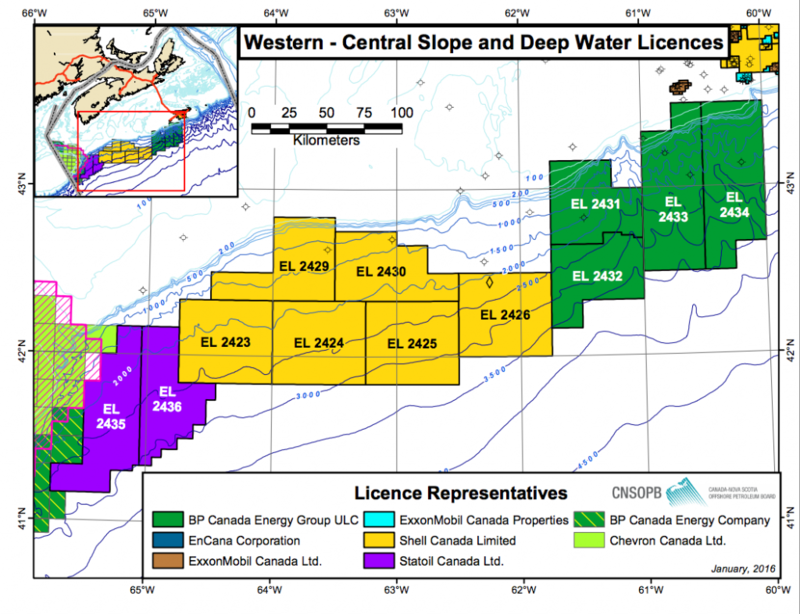 The Shelburne Basin Exploration Project is a proposed deep-water drilling program involving six exploration licenses (ELs) located approximately 250 kilometers offshore, south of Halifax, Nova Scotia. 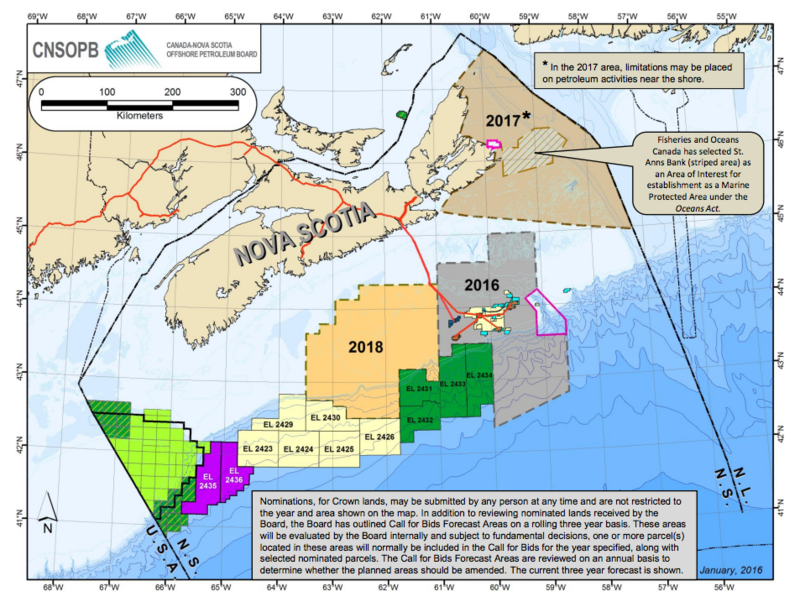 The purpose of this exploration project is to determine the potential presence of hydrocarbons in a geographical area known as the Southwest Scotian Shelf, in water depths ranging from 1500-3500 meters. Shell drilled two exploration wells in the fourth quarter of 2015 with the Stena IceMAX which is a dynamically positioned mobile offshore drilling unit suited for the North Atlantic environment and deep-water depths. 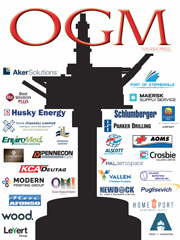 The IceMAX is one of the most state-of-the-art drillships in the world. Built in 2012, it’s contracted to Shell for five years to drill wells around the world. It is designed for safe and efficient operations in harsh weather environments and is a dynamically positioned drillship capable of drilling in water depths of 3000 metres. East Coast Catering (N.S.) Ltd. (ECC), in conjunction with their Joint Venture partners, the Mi’kmaq (Beaubassin Mi’kmaq Wind Management Ltd.), was awarded the catering contract by Stena to service the offshore drilling unit. Shell awarded contracts to three companies to provide four vessels, crewed mainly by Nova Scotians, to support its exploration program. Three support vessels will transport equipment and materials from Halifax to the drillship, and one vessel is dedicated to remain with the drillship at all times as a standby vessel. 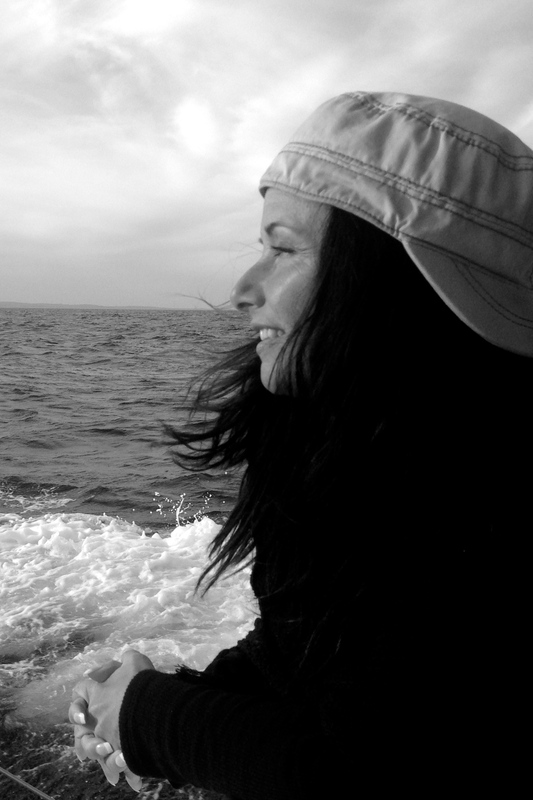 Tina loves to have thought-provoking conversations that lead to business growth and success.